Heat oven to 350°F. Line cookie sheets with parchment paper. Place each color candy in separate resealable freezer plastic bag; seal bag. With rolling pin, coarsely crush candy; set aside. In large bowl, beat butter and sugar with electric mixer on medium speed until light and fluffy. Beat in corn syrup, vanilla and lemon extract. On low speed, gradually beat in flour, baking powder and salt. Divide dough in half. On floured cloth-covered work surface, roll each half to 1/4-inch thickness. 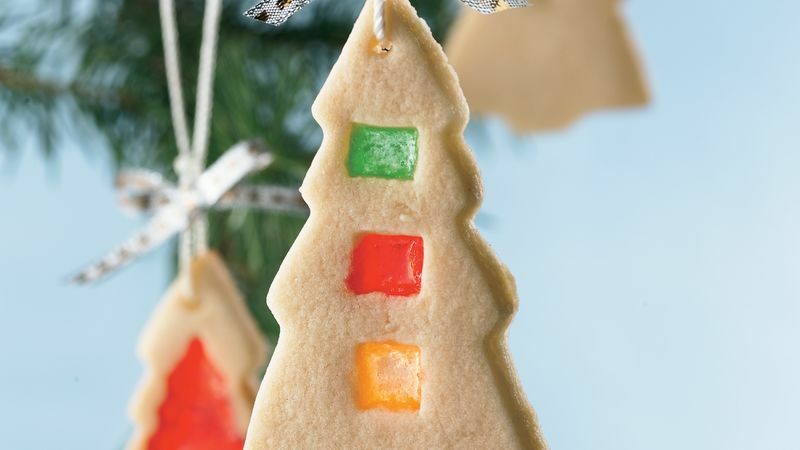 Cut dough with 3-inch Christmas tree-shaped cookie cutter. Cut out and remove several smaller dough shapes from each cookie. Place tree shapes 2 inches apart on cookie sheets. If desired, reroll small cutouts with remaining dough. Fill each hole in tree shapes with about 1/2 teaspoon crushed candy. Bake 8 to 10 minutes or until edges are light golden brown and candy is melted. Place cookie sheets on cooling racks; cool cookies 8 minutes. With back of metal pancake turner, gently lift warm cookies from foil; place on cooling racks. Cool completely, about 15 minutes, before storing in loosely covered containers. To hang cookies as ornaments, cut a 1/4-inch hole, using the end of a straw, in the top of each cookie before baking. For the “stained glass,” cut out shapes such as circles, hearts or other holiday shapes with canapé cutters found in specialty food stores.